Call me crazy, but I have already done my project for Thanksgiving! This wall hanging is 15" wide by 25" long and features machine applique with a simple pieced border. Although the colors on the picture are kind of funky (weather was not too clear when I took it), you can see they are fall colors with scrappy turkey feathers setting the mood. The background is Osnaburg; I used a high loft polyester batting to provide high relief to the applique and quilting. That chocolate cake would taste so good right about now! The blanket stitch around the applique shapes is one of my favorite parts of the wall hanging, as well as the free motion quilting, both done with Aurifil 40 wt. This pattern has been added to my Etsy store Quilterly. I do like his facial expression: we 'sometimes' look like that on Thanksgiving Day, don't we? 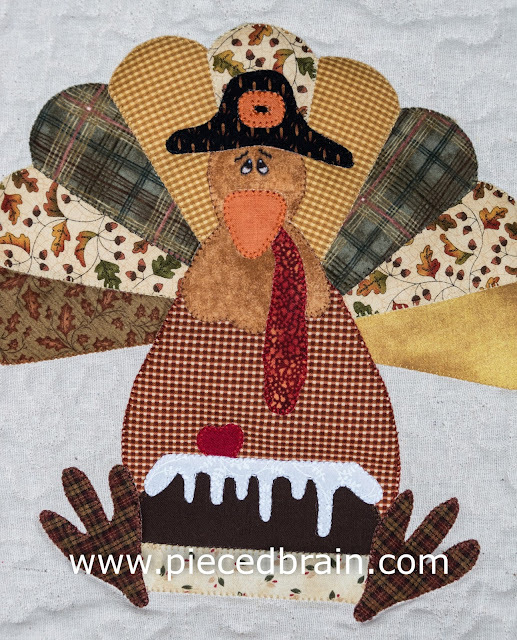 :-) I am linking up to Freshly Pieced and Esther's Blog on Wednesday, and to Crazy Mom Quilts, Confessions of a Fabric Addict and Quilt Shop Gal on Friday. So cute! 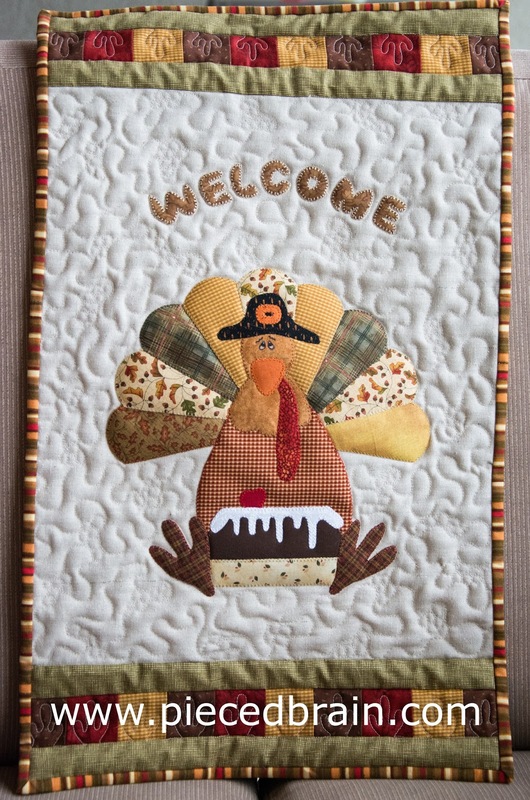 I have a very old quilt magazine with a larger, similar turkey that I've wanted to make for years. Never got around to it. Your Thanksgiving table will look festive! Thank you! I am loving this turkey! Crazy, no? Organised? Yes. Me? jealous! He is so cute, perfect to dress up your table during the Fall holidays! Adorable! Is he looking like that because he he's bringing dessert out and no one has any room to eat it? That would be me!! Nice to have it finished so early. Oh my goodness. He's absolutely adorable! You are so ahead of the holiday game!